The trailer for Kong: Skull Island was released at San Diego Comic-Con this weekend. The movie has quite the all star cast: Samuel L. Jackson, John Goodman, Tom Hiddleston and Brie Larson are all on board for this action-filled monster movie. And while every Honey is super excited for a remote chance of seeing Hiddlebum again (thank you Crimson Peak and High Rise for these gifts to the world)… that might be all we are excited for. The plot seems fairly simplistic: a military expedition, including civilians, visits an uncharted island. Their helicopter is mysteriously attacked (by a flying palm tree) and they are stranded on the island, where they are clearly not alone. We get a glimpse of what appears to be dinosaur bones, an indigenous tribe, and very briefly, of the massive King Kong monster himself. Honestly, in watching this trailer, I can’t decide if the film would be more appropriately named Snakes on a Plane 2 or Jurassic Park 5. Samuel L. Jackson’s aggressive questioning and assertive statement-making voice over sure seems to indicate there may be a lot of “memorable phrases” coming from this film. At the same time, there seems to be a nearly identical plot line of this film to Jurassic Park 3. Either way, the film seems to be a lot of big pretty action sequences with plenty of monster. What remains to be seen is how much plot lies behind all of the CGI goodness. But Tom Hiddleston is in it. If that’s not a selling point, I don’t know what is. 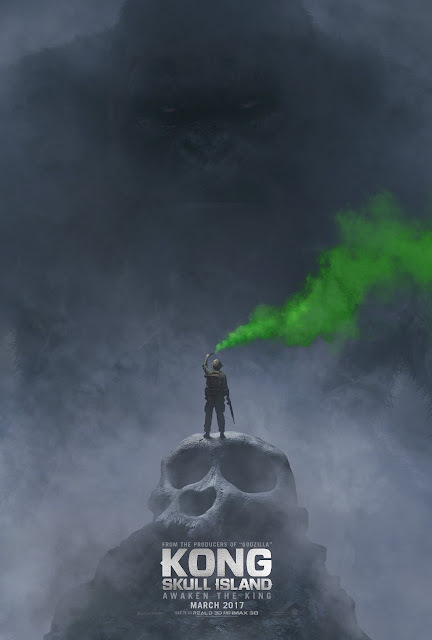 Do you plan on seeing Kong: Skull Island?